Day two of the holiday and quest to see if customer service is to blame for slow business, or whether it is all economic! Like all well planned events, this one didn’t go completely as per schedule as the day progressed. Initial plan today was to head to the Otway Fly Treetops walk, then head down as far as Peterborough and drop in at all the touristy spots along the way back to Apollo Bay. I took the liberty yesterday to make an online booking at the Treetops walk site (www.otwayfly.com.au) and booked the family for today. All went perfectly, and I got an email confirmation with the warning to be there 15 minute prior to my booked time, or I may miss my spot! All good as well, if I had a time or picked a time, but it wasn’t an option. I decided to shoot off an email last night in hope I may get some clarification, as I had a feeling this was for the longer tour and Fly Wire part, which I wasn’t doing. I had no expectation of a result, as it was just a generic info@ email address, but was most impressed when I got a reply, advising me not to worry and I could come any time today- cool! So off it was to the Otway Fly. Set the iPhone address and trusted my technology to take me, even if it wasn’t as per the way we looked at on the map, but hey, full tank of fuel – no issue. The road became a track, which then became a path, then dirt, then more like a bike track. The service on the phone dropped out and we just kept on cruising along this ‘road’ that I would fear seeing another car on the edge of sheer cliffs, tropical ferns, massive trees etc…nice drive, but no idea where we were….until….oh that’s where we are…a dead end that we have to take back to town…great an hour wasted, so back we go, get service on the phone, check, double check and it wants to send us back down there. We do one more part drive down the same road to see if a turn was missed, but no…iMaps was officially declared ‘crap’. I had heard and read as much but had previously had no issues, so we started off again, the way the old fashioned map told us! It was about 40km out of town that we changed plans…lets head down to Peterborough and work our way back then do the Treetop’s as we need to be there by 4 and it was only 10 ish now so heaps of time. I didn’t calculate the number of drivers who had just bought a license and set themselves behind the wheel for the first time, or who take a ‘scenic road’ too literally and crawl along at a ridiculous pace to see every bend….maybe I’m too impatient..Yep I am. Anyway, we get to 12 Apostles and very impressed in the setup, car park facilities, new underpass to the eco-friendly track etc. A lot different to the 25-30 years ago since my parents brought me here…and for the better. We did the photos and the walk etc. then grabbed 4 ice creams and a couple of other bits of junk food, then went to pay the bargain price of $29.85 (nice margins) but “sorry no EFPTOS- Cash only”. Now I know we are not in civilisation but we aren’t in Ying Yang either, how can a major tourist spot not take EFTPOS? I had to dig, rumble and fossick to find some cash to pay for the stuff my kids had already have devoured, so I couldn’t put it back! No ATM, nothing. A bit poor I felt, and I am sure there has been many a person caught out by this, let alone potential lost sales for the operators due to people not carrying a lot of cash. I have paid using a debit card for just about everything so far and have been carrying very little cash on me, which I didn’t think was that uncommon? The day started to pass and the decision to take a midday dip to the pier and lunch at a beautiful Port Campbell was making the Tree Tops pre booked ticket look doubtful. “I guess that’s wasted I said”, but then decided to give them a call and see if it could be moved, but having very very low expectations, and was a little reluctant as I didn’t want to be laughed at down the phone! “Yeah, no problem mate, she’ll be right, just make sure ya use it in the next day or two right?” AWESOME, looks like we head there tomorrow! 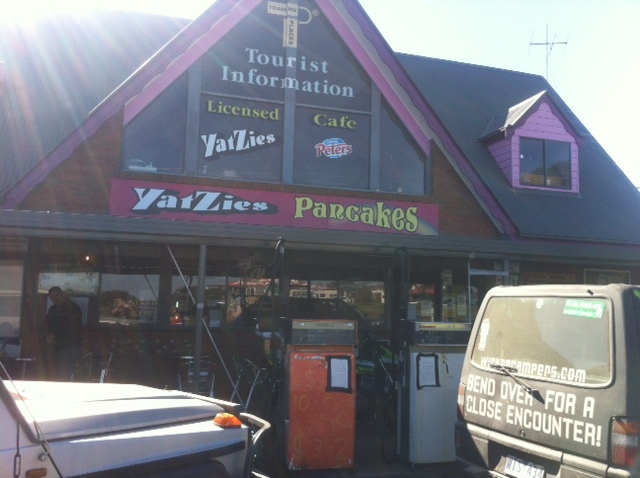 The return trip is broken half way at YatZies Café and Tourist Information Centre (plus general store, fuel station, camping, fishing, tour booking, bar etc. etc.) at Lavers Hill. This place had everything and was pumping with business. Service was great, friendly and genuine with great coffee and really good locally made pies or all flavours (there’s dinner for the kids sorted). I happened to overhear (or purposely eavesdrop) a discussion by whom I assume was the owner and a couple of foreign tourists looking for some meat for their bbq at their camp. He disappears outside and into the main house, and comes back holding up two steaks. “Here ya go boys, a couple a Porterhouses…bloody beautiful and I’ll give ya a special price of what I pay from me mate the butcher…I pay $2.50 each”. They say they are great and are about $8-10 in town and can they pay $4 or 5 then if he pays $2.50. “Nah…$2.50 is the price for you guys”. Now, you can look at this and say the guy is a little mad as I doubt he would be making anything from this sale, or is he being smart and taking a punt on these guys being around the area for a few days and hoping they will come back? I can guarantee if they are in the area they would come back at every need they had to this store based on how they were treated and the bargain they got. The smiles and level of appreciation on their faces told that story. I was humbled to see some true awesome country town service and sincerity. I know I will pass by there tomorrow and I will go back there for coffee based on today. Finally back in Apollo Bay and call via the Seafood Co-Op as some pan fried prawns would be nice for dinner…”Sorry sold out mate”…..damn….! IGA for some meat? I park, run in and have to fight a bunch of ferals at the door and checkouts to get in, let alone move inside the place, so decide to abort and fight my way out again, looks like it is whatever I can find back at the apartment. That was day 2, from cash only to not being able to spend my money at the end of the day with some great service in between. This is my second attempt at writing this as I lost my first one, so have dug out the laptop for this one and writing in word then copying to Word press, so I hope it wasn’t too different to my first one! I guess you could say the good, the bad and the ugly. Great post.